Duke University awarded 515 degrees to undergraduate and graduate engineering students on Saturday and Sunday, May 15 and 16, in a weekend of commencement exercises that began with diploma ceremonies for professional masters degree students, continued with a university-wide ceremony at Wallace Wade Stadum and included Pratt School of Engineering celebrations at Cameron Indoor Stadium. A special note for the Class of 2016 is that it contains the first Pratt School of Engineering graduates to earn bachelor of science degrees in environmental engineering – Jacob Feldman King and Samantha Rae Thomas. Duke men's basketball coach Mike Krzyzewski delivered the University’s commencement address, while Pratt Dean George Truskey and Emily Paige Bauman, senior class president, spoke at the undergraduate engineering school ceremonies on Sunday. Watch the undergraduate diploma ceremony. Truskey awarded Bachelor of Science in Engineering diplomas to 263 students (273 total for the Class of 2016, which includes students who earned degrees during the fall semester). The Class of 2016 includes 87 Master of Science and 88 PhD engineering graduates. The 2016 Master of Science graduates include students who are continuing their studies toward doctoral degrees. Watch the 2016 Master of Science hooding ceremony. Fifty-six Master of Engineering Management (MEM) and 21 Master of Engineering (MEng) degrees were awarded on May 15 (total graduates of those programs for the academic year, including September and fall 2015 graduates, were 180 and 43, respectively). Watch the 2016 MEM hooding ceremony, 2016 d-MEMP hooding ceremony and the 2016 MEng hooding ceremony. All told, the Pratt Class of 2016 includes 671 students. 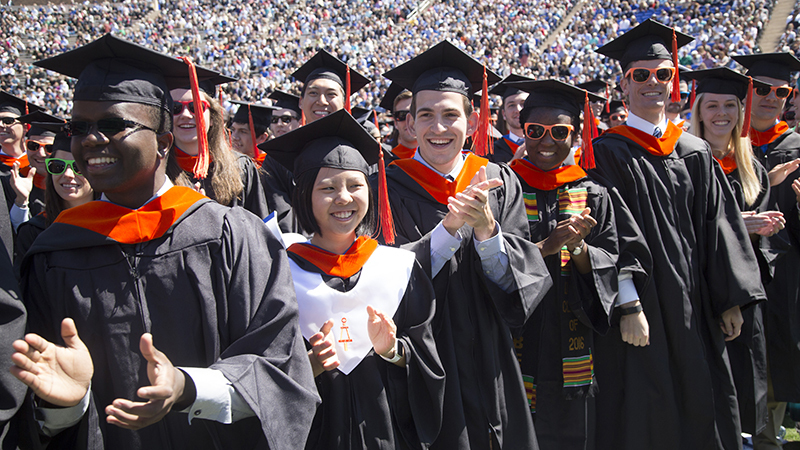 Overall, Duke awarded degrees to more than 5,300 undergraduate, graduate and professional degrees to students who are graduating this spring. Students who graduated in September or December 2015 were invited to participate in Sunday's ceremony.